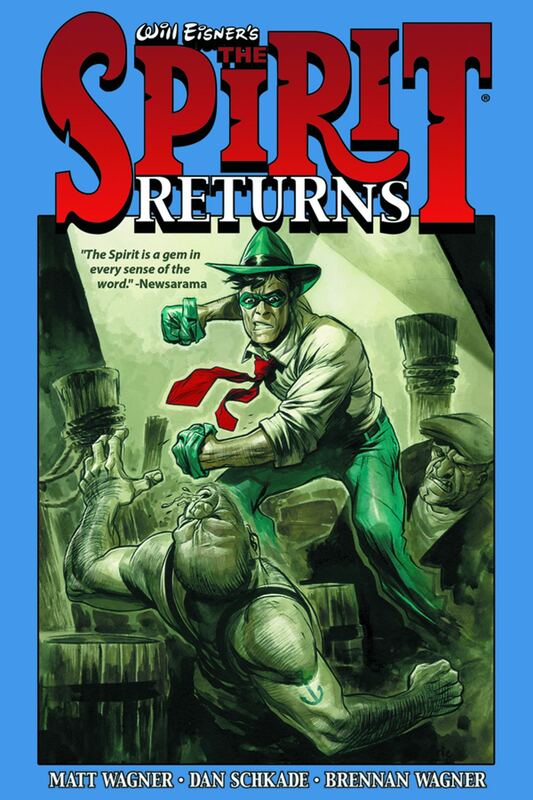 To celebrate the 75th anniversary of Will Eisner's most iconic character, Dynamite Entertainment proudly assembled the creative dream team of Eisner Award-winning author Matt Wagner, artist Dan Schkade, and colorist Brennan Wagner to honor the legend with an all-new adventure! The headline screams on Central City newspapers: "Who Killed The Spirit?" Commissioner Dolan, his daughter Ellen, and former sidekicks Ebony White and Sammy Strunk attempt to discover why The Spirit has been missing and presumed dead for the past two years. Has the famous blue-masked hero finally fallen victim to one of the malicious felons or beautiful femme fatales from his lengthy rogues' gallery of enemies? A crimefighting epic that honors the vital and prestigious legacy of one of comicdom's most talented and influential creators, Will Eisner! Character designs, sketches, and more!